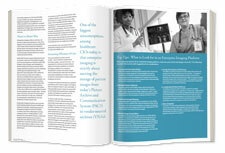 where do enterprise imaging & radiology fit in? If repeating studies delays care, increases costs and decreases patient satisfaction, then enterprise imaging may just be the interoperable image and information network needed to complete a successful value-based care strategy. Throughout the radiology workflow and beyond, from exam request, to image acquisition, to reporting, and onto collaboration, the radiologist is a full and central member of the care team, who contributes directly to achieving the goals of the value-based organization.